Aerospace Engine Testing – The Sky’s the Limit. Hoffer Flow Controls turbine flowmeters are used to test large propulsion engines within the aerospace industry. Hoffer turbine flowmeters have played a key support role since the early 1960’s with work on the Saturn program, the Space Shuttle Program, and now Hoffer flow meters will be used for testing the first and second stage engines on NASA’s new heavy lift rocket, the SLS or Space Launch System. 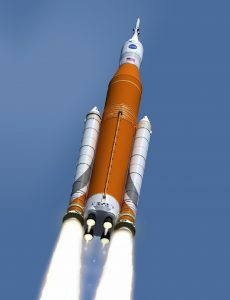 Designed to carry astronauts back to the moon and beyond to Mars, the SLS provides the US with its first manned flight capability since the end of the Space Shuttle Program in August, 2011. NASA conducts most testing of rocket engines and engine components at its state-of-the-art facilities located at the John C. Stennis Space Center on the Mississippi Gulf Coast, 50 miles northeast of New Orleans, LA. Hoffer has a long-standing relationship of supplying the center with flow meters used in the various test programs from smaller size meters 2” and under used for component testing to 8” to 16” meters used for live fire engine tests conducted at one of the many engine test stands at the Center. Fluids measured range from liquid hydrogen and oxygen at cryogenic temperatures down to -400°F and below as well as various other liquid rocket fuels and gases with operating pressures to as much as 15,000 PSIG. Hoffer recently supplied an HO12″X8″ flow meter for testing the second stage engine and its components for the SLS. This meter was constructed from a single-piece of 316/316L stainless steel material for the high pressure body. 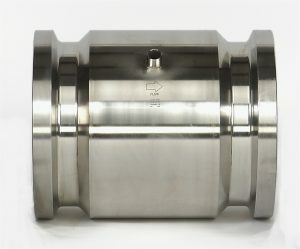 The end connections are Grayloc 12” hub and clamp style connectors with a bore through the body for 8” Hoffer turbine flow meter internals. With an 8,500 PSIG MAWP and a 5,000 GPM flow rate capacity, the meter weighs in at a hefty 500+ pounds without the mating hubs and connectors. This is but one example of Hoffer’s ability to engineer and construct custom flow measurement solutions for not only the rigors of rocket engine testing but for a wide variety of other demanding environments. Whether the application calls for the ability to measure high velocity cryogenic or hypergolic fuels, high operating pressures, special materials of construction or most any other out-of-the-box specification, Hoffer can deliver the solution. The success and track record of Hoffer meters in contributing to the US space program has made them a natural choice for many of the private launch rocket builders that have come into the industry in the past few years. Hoffer meters are also used extensively by the United States Air Force in advanced propulsion system development and are the first choice for several foreign space agencies as well. We look forward to helping meet the next challenges as mankind moves towards an ever-increasing presence in space for science, exploration and commercial enterprise. SLS rocket launches on its journey to the outer planets.